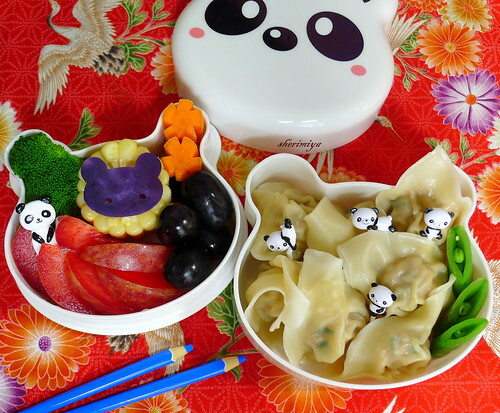 Wonton Pandamonium Bento, a photo by sherimiya ♥ on Flickr. I made wontons today! (See my method and recipe here). I was craving wontons drowning in chili oil, shoyu and vinegar, topped with green onions and peanuts. So good. But of course for the kids it gets served PLAIN (that's how kids like it; go figure). They're not pretty but they taste delicious. I squeezed a bunch into the bottom panda bento tier along with a few peapods, then filled the top with corn, carrots, broccoli, bear-shaped Okinawan sweet potato, pluot and grapes. Did you notice the clever way I tied the picks into the theme? It's "Panda"monium! A bit obvious? Nah. What a beautiful and fun bento! I've never had wontons with chili oil, shoyu and vinegar - not to mention the peanuts and onions. I must try that! OH man, I'd like to join you on this wonton feast! Home made wontons are the best! Cute panda theme! Thanks for the response on previous post - I never heard of Mochiko Chicken before. 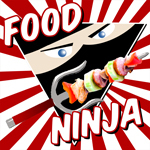 I really need to go to Hawaii and try all kinds of new Japanese food!!! Thanks Nami! You do have to go to Hawaii. Bring the whole family! I have the same food picks...:D)! Now you remind me that I almost never use my food picks, I should use them more often ;). Cooking Gallery : I love using picks when you don't have time to create cuteness. The pandas are especially cute :) Thanks! Sheri,thank you very much for the wontons tutorial.I made some couple of weeks ago and was a disaster. Your cooking is always yummy and super cute!